In July 2015, the American Nurses Credentialing Center's Commission on Accreditation released updated criteria for continuing nursing education, including updates to the Education Design Process. The primary nurse planner in the Public Health Nursing Approved Provider Unit in North Carolina's Division of Public Health applied the advancing research and clinical practice through close collaboration model and quality improvement strategies to facilitate the adoption and implementation of the 2015 criteria. This article describes an innovative approach to implementation using an evidence-based practice model and quality improvement tools and provides data regarding nurse planners' knowledge of accreditation criteria and role comfort during the first 6 months of implementation. J Contin Educ Nurs. 2017;48(11):501–507. Nurses participate in lifelong learning to keep abreast of current evidence-based practice (EBP), maintain and improve competence, and contribute to quality patient outcomes. Continuing nursing education (CNE) is recognized by State Boards of Nursing, employers, and certifying bodies as being grounded in educationally sound principles with content specific to nursing practice. The American Nurses Credentialing Center's Commission on Accreditation (ANCC COA) is the international entity that sets standards for CNE and accredits organizations to approve and provide CNE contact hours. In July 2015, the ANCC COA released updated accreditation criteria (ANCC, 2015), required to be adopted in 2016. An EBP implementation model and quality improvement (QI) strategies were combined to facilitate the adoption, implementation, and sustainability of the new criteria in North Carolina's Public Health Nursing approved provider unit (APU). The North Carolina Public Health Nursing APU consists of nurse planners representing women's health, child health, school health, communicable disease, and public health nursing specialties; an APU administrator who provides contract oversight; a primary nurse planner who holds authority and accountability for the unit; and an administrative assistant. The APU provides CNE for local and state public health nurses in North Carolina. EBP models can provide an organized framework to guide the process of integrating and translating evidence into practice (Schaffer, Sandau, & Diedrick, 2013). Several models are available, and the model that best aligns with the structural capacity of North Carolina's Public Health Nursing APU is the advancing research and clinical practice through close collaboration (ARCC) model (Figure; Schaffer et al., 2013). Advancing research and clinical practice through close collaboration model. The ARCC model increases employees' belief in EBPs, adherence to change, group cohesion, and job satisfaction. These improvements are realized by using readiness assessments and the use of mentors (Levin, Fineout-Overholt, Melnyk, Barnes, & Vetter, 2011; Melnyk, 2012; Melnyk, Fineout-Overholt, Gallagher-Ford, & Stillwell, 2011). The ARCC model fits well with the structure of APUs because the primary nurse planner (a role required by the ANCC COA) is responsible for orienting, training, and mentoring nurse planners (ANCC, 2015). The four parts of the ARCC model provide an easy framework to follow when integrating and translating evidence into practice. QI strategies help organizations improve more effectively and sustainably by providing systematic approaches to change. Two QI tools, the Kaizen event and the value-stream map, have been applied successfully in many public health organizations (Smith, Poteat-Godwin, Harrison, & Randolph, 2012). Kaizen, a Japanese term meaning to change for better outcomes, is the foundational philosophy for an organizational improvement process known as the Kaizen event (Knechtges & Decker, 2014). A Kaizen event is a multiday (i.e., typically 3 to 5 days) rapid-cycle improvement event during which a team works continuously to analyze processes in a problem, identify problem areas for improvement, and complete small tests of change through plan-do-study-act cycles (Emiliani, 2005; Gershengorn, Kocher, & Factor, 2014; Smith et al., 2012). The use of a Kaizen event facilitator offers input from an expert in the process who is outside of the organization and assures that the event progresses without missed steps or bias (Emiliani, 2005; Marksberry, Badurdeen, Gregory, & Kreafle, 2010). The literature provides an example of a public health Kaizen event at Albemarle Home Care, a certified Home Health and Hospice agency in northeastern North Carolina (Smith et al., 2012). During a 4-day Kaizen event addressing inefficient provider scheduling practices, a series of plan-do-study-act cycles were used to make small incremental changes to the scheduling process, leading to increased efficiency in the scheduling method. With no staffing changes, the agency increased the number of patients by 4% and patient visits by 8%, and saw a 12% decrease in operating costs from July 2009 to June 2010. The Kaizen team at Albemarle Home Care also used value-stream mapping during the Kaizen event to create a visual representation of the scheduling process and identify areas of rework (Smith et al., 2012). Value-stream mapping is a type of process flow mapping used to plot every step of a work process, thereby identifying gaps, nonvalue-added activities, and waste, such as long delays or long process time (Health Resources and Services Administration, 2011; Simon & Canacari, 2012; Smith et al., 2012). A pertinent example from the literature is the Colorado Department of Public Health and Environment's use of value-stream mapping to examine their Laboratory Services' 12-step practice of sample processing. During the value-stream mapping exercise, the agency identified 239 hours of nonvalue-added steps in the practice. The ensuing changes resulted in a decrease in the average sample turnaround time from 20 days to 7.5 days and an increase from 58% to 88% of samples reported in 14 days or less (Peterson-Wright, 2013). Using an organized approach to facilitate the adoption and implementation of the 2015 criteria was essential for this North Carolina Public Health Nursing APU because it had been in a state of disarray since the long-time contracted primary nurse planner retired in May 2014. The role was left unfilled, and without the support of a primary nurse planner, the nurse planners started to approach their role more as event planners and form completers than leaders in the process of educational activity planning, implementation, and evaluation (Dickerson, 2016). Because of inconsistent messaging from the approver unit under which the APU has the authority to function, the requirement of a primary nurse planner in the APU was not understood, and Division management did not insist the contracting agency fill the position by a nurse who could function as the primary nurse planner. Workarounds had been implemented to fill the gap of the missing oversight. Realizing the complexity of the changes that would need to occur to adopt the new criteria and the influence the changes would have on nurse planners, one of the nurse planners (the primary author [S.H.L.]) volunteered to step into the role of acting primary nurse planner. The acting primary nurse planner then sought evidence-based models and tools to support the successful implementation of the criteria. The ARCC model was chosen, and the steps of the model were initiated. The acting primary nurse planner chose a blended method of deploying surveys to nurse planners and conducting key informant interviews to assess the culture and readiness for the 2015 criteria adoption and implementation. In early April 2016, all nurse planners (N = 16), excluding the APU administrator and acting primary nurse planner, were asked to anonymously complete a survey of strengths, weaknesses, opportunities, and threats (SWOT) to the APU and nurse planner role they believed would influence the adoption of the new accreditation criteria (Table 1). Internal partners, including past nurse planners and current nursing management, and external partners, including joint providers, were interviewed via phone and asked a series of questions addressing the same points. The nurse planners were asked to self-rate their perceived knowledge of the current ANCC COA criteria using a 5-point Likert scale. Comfort in their nurse planner role also was assessed using the same 5-point Likert scale (Table 1). The scale ranged from 1 = not at all comfortable to 5 = expert; I could train others. Responses remained confidential through the use of self-selected unique identifiers. Desire to follow EBP, provide CNE, deliver a quality product, and collaborate with a primary nurse planner were among the identified strengths in the SWOT assessment. Time constraints, competing priorities, role confusion, repetitive and lengthy forms, inconsistent practice, and low competency and confidence were among the weaknesses identified by nurse planners and key informants. Identified opportunities included belief in QI processes to maintain quality, the value of the nurse planner role, the chance to standardize processes, and the opportunity to communicate the importance of the nurse planner role to the North Carolina Division of Public Health management. Issues that posed threats to the adoption of the new criteria included seeing the new criteria as requiring additional work, inadequate understanding and knowledge necessary to implement the new criteria and related documentation, and lack of access to resources necessary for quality implementation. Provider Criterion 1. Structural capacity describes the role of the primary nurse planner to include mentoring, coaching, and managing the competencies and performance of nurse planners related to planning, implementing, and evaluating CNE activities (ANCC, 2015). The acting primary nurse planner (S.H.L.) frequently communicated her availability and commitment to help the nurse planners while the new criteria were being adopted and training and implementation processes were being undertaken. The acting primary nurse planner also received regular mentoring and support from the approver unit lead consultant and through a formal mentoring relationship with an ANCC COA commissioner. In April 2016, a Kaizen team, including the APU administrator, the APU administrative assistant, the acting primary nurse planner, five of the 16 nurse planners representing various public health nursing specialties, and an experienced Kaizen Facilitator, met for 3 days. Two goals of the Kaizen event were to begin the analysis of the SWOT assessment and create a value-stream map to identify where to focus organizational improvement efforts. The results of the SWOT assessment were discussed and issues were identified that needed to be addressed prior to and during adoption and implementation of the new criteria. Creating and analyzing a value-stream map of the current education design process used by the nurse planners aided the identification of gaps, nonvalue-added activities, and waste. 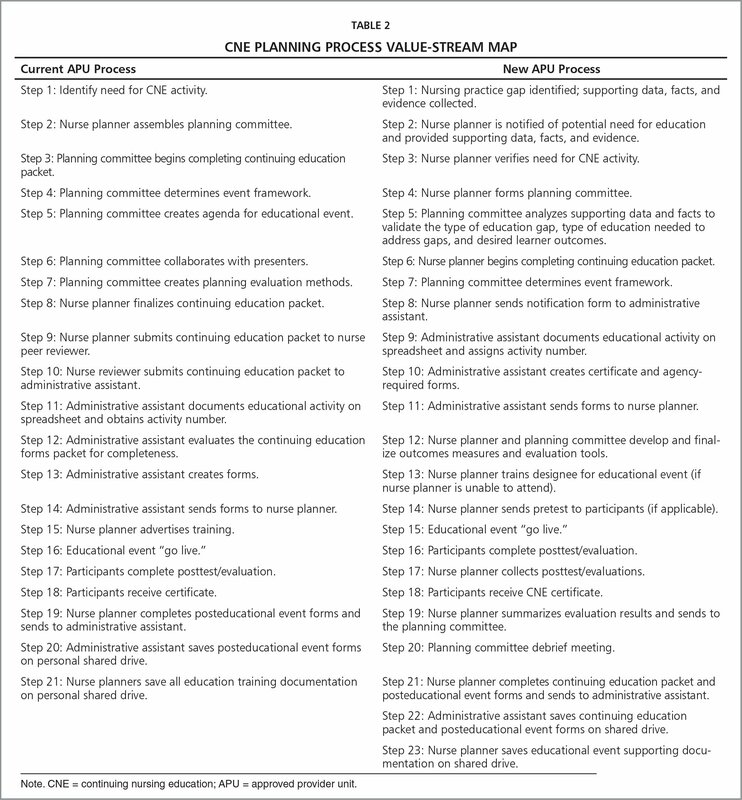 A value-stream map of the expected postimplementation process (Table 2) was then created as a means to identify the best process for following the new accreditation criteria during the CNE planning process. A communication plan was created for the APU administrator to share the value of the nurse planner role and the importance of the APU with senior management of the North Carolina Division of Public Health. The APU administrator also was assigned responsibility for ongoing communication with senior management on APU changes. The Kaizen team also planned the steps needed to educate the greater nurse planner team about the new ANCC COA criteria. Then, the acting primary nurse planner designed a blended educational activity consisting of recorded Webinars, assigned reading, and face-to-face content, which was provided to the nurse planners starting in July 2016. Content included introducing the new ANCC COA criteria with an emphasis on the education design process, the new forms selected for use in the APU, identifying professional practice gaps and educational needs, introduction to learner outcomes, the purpose of the nurse planner role, the Kirkpatrick evaluation model (Dorri, Akbari, & Dorri Sedeh, 2016) and adult learning principles (Palis & Quiros, 2014). In December 2016, a postimplementation survey of nurse planners was deployed to evaluate the effects of project implementation on their comfort level in their role and their perceived knowledge of 2015 accreditation criteria (Table 1). Challenges with the self-selected unique identifiers required the primary nurse planner to take extra steps to increase response rate (Table 3). The preimplementation survey response rate was 93.75% (15 of 16). Two nurse planners withdrew from the nurse planner role during the project period due to changes in job responsibilities. The postimplementation survey response rate was 92.86% (13 of 14), with the final statistical sample comprised of 13 nurse planners, identified only by the anonymous unique identifiers. SPSS® version 24 software was used to analyze the data. Preimplementation perceived knowledge of ANCC COA accreditation criteria responses resulted in a median of 2.0 and mean of 2.46, with a positive skew regarding non-normal data. Postimplementation perceived knowledge of ANCC COA accreditation criteria responses resulted in a median of 4.0 and a mean of 3.38, with a negative skew related to nonnormal data (Table 4). Preimplementation comfort in nurse planner role responses resulted in a median of 3.0 and mean of 2.69, with a positive skew related to nonnormal data. Postimplementation comfort in nurse planner role responses resulted in a median of 3.0 and a mean of 3.31, with a negative skew related to nonnormal data (Table 4). Wilcoxon signed-rank tests were conducted to convert the scores to ranks because the Likert scores were non-normal. The test revealed a statistically significant increase in perceived ANCC COA criteria knowledge level postintervention, Z = −2.489 (based on negative ranks), p = .013, and a large effect size of .49. The test also revealed a statistically significant increase in comfort level postintervention, Z = −2.530 (based on negative ranks), p = .011, and a large effect size of .49. The ARCC model fits well with the structure of APUs and the role of the primary nurse planner. The ARCC model supports the use of evidence-based guidelines, such as the ANCC COA accreditation criteria. Using the ARCC model aided the North Carolina Public Health Nursing APU during the process of adopting the 2015 criteria by providing a framework that ensured addressing facilitators and barriers to implementation and the use of the primary nurse planner as mentor to support adherence. Pre- and postimplementation survey data showed a statistically significant and meaningful increase in perceived knowledge of ANCC COA criteria and comfort level in the nurse planner role when the ARCC model was used to guide the adoption and implementation of the 2015 ANCC COA accreditation criteria in the North Carolina Public Health Nursing APU. Several factors were present that may have influenced the project outcomes. Five of the 13 nurse planners in the data sample participated in the Kaizen event and had extra exposure to the 2015 accreditation criteria. In addition, all nurse planners had increased exposure to the 2015 accreditation criteria and nurse planners' roles and responsibilities through the North Carolina Public Health Nursing APU newsletter and a follow-up Webinar call in fall 2016. The ARCC model is not descriptive of tools to use during implementation. The acting primary nurse planner chose to do a SWOT analysis because of past experience using the tool and familiarity within the organization. The Kaizen event is a proven approach to successful management of change and had been used by many North Carolina Division of Public Health nurse planners and the acting primary nurse planner in other position duties, including providing QI consultation to North Carolina's local public health departments. During the implementation of the project and adoption of the criteria, the acting primary nurse planner was assigned duties related to leadership of the APU, in addition to her regular duties within the North Carolina Division of Public Health. It quickly became evident that providing leadership, management, and oversight of the APU is a full-time responsibility. The substantial improvements as a result of this project also underscored the importance of a having a dedicated and innovative primary nurse planner. As a result of the data collected that showed the value of the APU to the organization, and the value of the primary nurse planner to the APU, the acting primary nurse planner was able to release her other responsibilities and begin official full-time leadership and management of the APU 2 months after the project period ended. The ANCC COA criteria implementation project shows the usefulness of the ARCC EBP model in facilitating the implementation of EBP guidelines and translating evidence into practice in a state public health nursing CNE approved provider unit. Sustainability of the change and continued QI will be accomplished by adherence to the ANCC COA criteria, with concentration on quality measures and outcomes through Provider Criterion 3: Quality Outcomes (ANCC, 2015). Approver and provider units are encouraged to explore the use of EBP models and QI tools when embarking on systematic approaches to change and translating evidence into practice. Peterson-Wright, L. (2013). Applying the value stream mapping approach to laboratory processes. Bridges, 11, 2–4. What strengths in the current APU and nurse planner role do you believe will facilitate the adoption of the new evidence-based accreditation program criteria and educational activity documentation by the APU and nurse planners? What weaknesses in the APU and nurse planner role do we need to address before adopting the new evidence-based accreditation program criteria and educational activity documentation? What opportunities are there for the APU and nurse planners to take advantage of when adopting the new evidence-based accreditation program criteria and educational activity documentation? What threats do you believe the APU and nurse planners could face when implementing the new evidence-based accreditation program criteria and educational activity documentation? How comfortable do you feel in the nurse planner role? 1. Expert; I could train others. How would you rate your level of knowledge of the accreditation program criteria you have been working with to plan, implement, and evaluate educational activities up to this point? 1. Not at all knowledgeable about the criteria. Somewhat knowledgeable about the criteria. Adequately knowledgeable about the criteria. Very knowledgeable about the criteria. How comfortable do you feel in the nurse planner role? 1. How would you rate your level of knowledge of the accreditation program criteria (the 2015 ANCC criteria and Education Design Process)? 1. Step 1: Identify need for CNE activity. Step 1: Nursing practice gap identified; supporting data, facts, and evidence collected. Step 2: Nurse planner assembles planning committee. Step 2: Nurse planner is notified of potential need for education and provided supporting data, facts, and evidence. Step 3: Planning committee begins completing continuing education packet. Step 3: Nurse planner verifies need for CNE activity. Step 4: Planning committee determines event framework. Step 4: Nurse planner forms planning committee. Step 5: Planning committee creates agenda for educational event. Step 5: Planning committee analyzes supporting data and facts to validate the type of education gap, type of education needed to address gaps, and desired learner outcomes. Step 6: Planning committee collaborates with presenters. Step 6: Nurse planner begins completing continuing education packet. Step 7: Planning committee creates planning evaluation methods. Step 7: Planning committee determines event framework. Step 8: Nurse planner finalizes continuing education packet. Step 8: Nurse planner sends notification form to administrative assistant. Step 9: Nurse planner submits continuing education packet to nurse peer reviewer. Step 9: Administrative assistant documents educational activity on spreadsheet and assigns activity number. Step 10: Nurse reviewer submits continuing education packet to administrative assistant. Step 10: Administrative assistant creates certificate and agency-required forms. Step 11: Administrative assistant documents educational activity on spreadsheet and obtains activity number. Step 11: Administrative assistant sends forms to nurse planner. Step 12: Administrative assistant evaluates the continuing education forms packet for completeness. Step 12: Nurse planner and planning committee develop and finalize outcomes measures and evaluation tools. Step 13: Administrative assistant creates forms. Step 13: Nurse planner trains designee for educational event (if nurse planner is unable to attend). Step 14: Administrative assistant sends forms to nurse planner. Step 14: Nurse planner sends pretest to participants (if applicable). Step 16: Educational event “go live.” Step 16: Participants complete posttest/evaluation. Step 17: Participants complete posttest/evaluation. Step 17: Nurse planner collects posttest/evaluations. Step 18: Participants receive certificate. Step 18: Participants receive CNE certificate. Step 19: Nurse planner completes posteducational event forms and sends to administrative assistant. Step 19: Nurse planner summarizes evaluation results and sends to the planning committee. Step 20: Administrative assistant saves posteducational event forms on personal shared drive. Step 20: Planning committee debrief meeting. Step 21: Nurse planners save all education training documentation on personal shared drive. Step 21: Nurse planner completes continuing education packet and posteducational event forms and sends to administrative assistant. Step 22: Administrative assistant saves continuing education packet and posteducational event forms on shared drive. Step 23: Nurse planner saves educational event supporting documentation on shared drive. Each nurse planner was asked to select a unique identification (ID) based on the name of their first grade school and the same unique ID was supposed to be used for both pre- and postimplementation surveys. An initial look at the postimplementation responses showed four new unique IDs had been used. To address the problem, the list of the unique IDs that did not have a postimplementation survey match were shared with the nurse planners with an explanation of the discrepancy and request for repeat survey completion by affected nurse planners. After the postimplementation survey period closed, any surveys with unmatched unique IDs were excluded from final data analysis. After conclusion of the project, informal discussion with the nurse planners revealed that several nurse planners had attended more than one first grade school and they could not recall which school name they had used for their unique ID. In the future, asking respondents to select a unique ID based on the name of the high school from which they graduated would be a safer approach. Dr. Little is Primary Nurse Planner, CNE Approved Provider Unit, and Ms. Rocco is Branch Head, Local Technical Assistance and Training Branch and Public Health Nursing and Professional Development Unit, NC Division of Public Health, Raleigh; Dr. Randolph is President and Chief Executive Officer, Public Health Improvement Partners, Morrisville; Dr. Short is Associate Professor, Duke University School of Nursing, Durham, North Carolina; and Dr. Dickerson is Director of Continuing Education, Montana Nurses Association, Montana City, Montana. Address correspondence to Susan H. Little, DNP, RN, PHNA-BC, CPHQ, Primary Nurse Planner, CNE Approved Provider Unit, NC Division of Public Health, 11 Deer Lake Trail, Wendell, NC 27591; e-mail: DrSusanLittle@alumni.duke.edu.